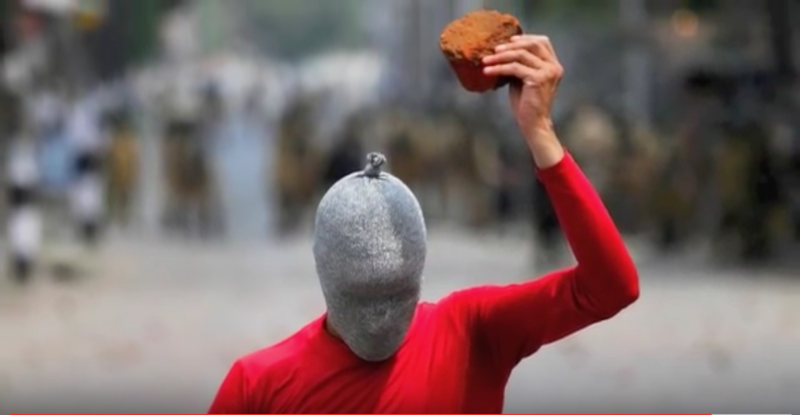 Anthem for Kashmiri Intifada on a day commemorating Palestinian Intifada: two political struggles yoked in historic battles for self-determination against colonialism & military occupation. Their victories would change the balance of power around the world to the advantage of the oppressed. Their struggles are our struggles. Educational postcard distributed at cultural event in Germany by Ahmad Yacob & other Palestinian solidarity activists to commemorate Naqba 2017. It was of course distributed in German. 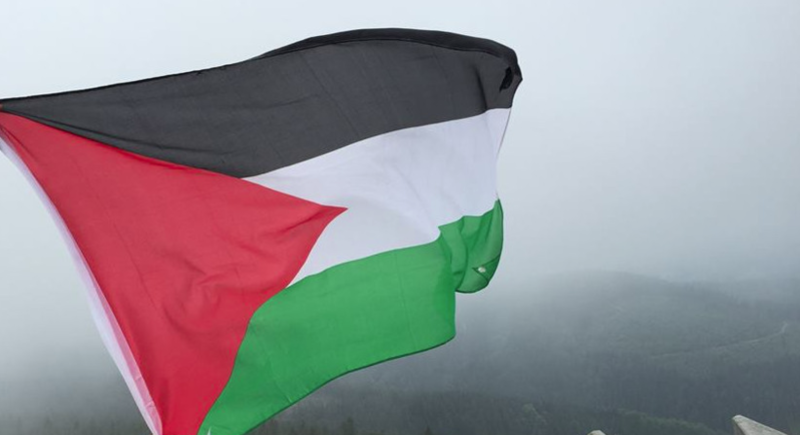 Often I tell the story of how a lone Palestinian protester at the University of Minnesota got me involved in Palestinian solidarity. It was during the June 1967 Six-Day War when the Israeli military defeated the armies of Jordan, Egypt, & Syria. It was a watershed & deeply tragic moment in history for the Palestinians. Israel’s military victory led to the occupation of the West Bank, East Jerusalem, & Gaza; demonstrated Israel’s value to the US as a fortress for US hegemony in the Middle East (US military aid has been increasing ever since); altered the relationship between the US & Arab regimes to the disadvantage of the Arab peoples; & altered the relationship between Arab regimes & Palestinians to the disadvantage of Palestinians. In June 1967, I didn’t know any of that & could not have pointed to Palestine on a map but the near-hysterical pro-Israel media coverage disturbed me since I knew we were being played. Why were we being whipped into a frenzy? Why wasn’t the war reporting on the Six-Day War as bland as coverage of the Vietnam War? Walking across the U of M campus during the Six-Day War, I saw a lone Palestinian with a placard protesting in front of the student union. Hoping he would shed some light on the issue, I approached him & asked why he was protesting. In 1967, there was no Palestinian solidarity movement. Palestinians were completely isolated internationally & the Exodus mythology was riding high. The young man was scared & might have thought I was baiting him so he answered quite gruffly “They stole our land.” When I asked him what he meant, he answered again “They stole our land.” Not much, but enough for me to know there was more to the story that needed investigation & I went out looking for some answers, eventually becoming committed to the Palestinian cause & active with the U of M Arab student organization which then served as Palestinian solidarity. Now my friend Ahmad Yacob has told me about how that lone picketer from 1967 influenced his work building Palestinian solidarity in Germany. Ahmad is from a family displaced by the Naqba to Syria. He has been organizing Palestinians to do educational work, to intervene in cultural events with exhibitions about Palestinian culture & postcards about the Naqba, & with a social media campaign. He told me he often remembers my story about the young guy from the U of M in 1967 & that to inspire the small group of activists in Germany he related the story. The fellow who stood alone & scared has no idea what an impact he has had in building Palestinian solidarity. There is probably no more vilified struggle than the Palestinian movement against colonialism & occupation which has long been portrayed as terrorists & suicide bombers. It is likely that the full-blown hate & war-mongering ideology of Islamophobia was honed in the campaign to demonize Palestinians. 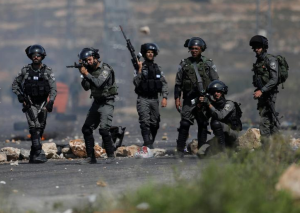 Since 1948, Palestinians have stood mostly alone in their struggle against Zionist paramilitary death squads, armed settlers, & the Israeli army backed by the US, UK, & other colonial forces. Solidarity with them is a fairly recent, although massive, development. In 2014, over a million people around the world protested Israel’s 7-week carpet bombing of Gaza. Like Kashmiris, unarmed Palestinians use stones as defense against brutal military forces armed to the teeth with the most sophisticated & deadly arsenal. Should they just stand there & let their olive trees be uprooted, their wells poisoned, their lands confiscated, their children brutalized & assaulted? Should they just accept occupation, apartheid, ethnic cleansing without a struggle? The greatest tribute paid to Palestinians was by Kashmiri youth who recognized the political affinities between their own struggle & Palestinians, identified with Palestinian resistance, & began to call their own struggle against Indian occupation the Kashmiri Intifada. 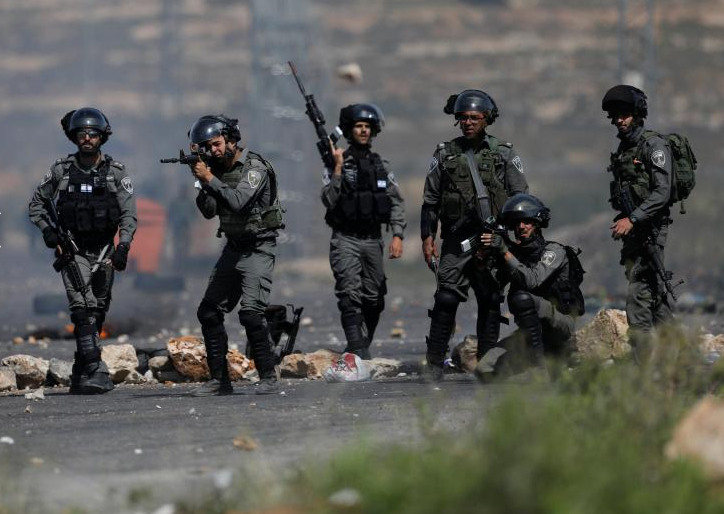 These Palestinians stand opposite phalanxes of Israeli security forces trying to stop protests in support of Palestinian political prisoners on hunger strike near the West Bank city of Ramallah & the Israeli settlement of Beit El. Support Palestinian Intifada & boycott all Israeli products (barcode beginning 729). Their struggle is our struggle. 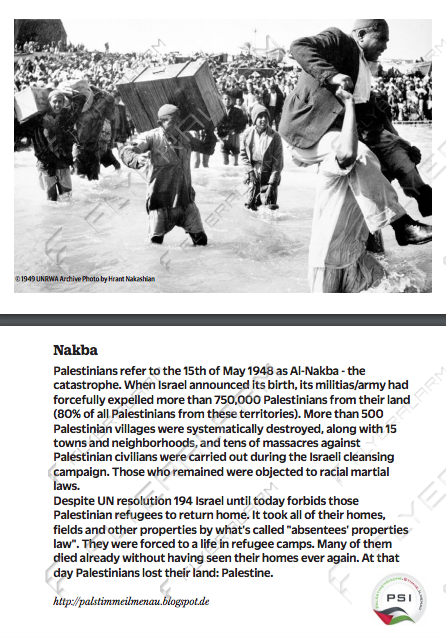 May 15th is Naqba (Catastrophe) Day commemorating 69 years since 780,000 Palestinians were forcibly driven from their homeland by Zionist paramilitary terrorist squads under the protection of the British. Over 500 Palestinian villages were depopulated & destroyed. Palestinians have never reconciled themselves to the violent dispossession & proclamation of a state of Israel in their stead. More than 7 million Palestinian refugees, one of the largest refugee communities in the world, continue to live in refugee camps in Gaza, the West Bank, Jordan, Lebanon, & Syria. The West Bank, East Jerusalem, & Gaza with a combined population of nearly 5 million Palestinians have been under military occupation since 1967. Gaza is under an Israeli blockade making it what is called “the world’s largest open air prison” & has sustained several sieges of Israeli carpet bombing along with periodic bombing sorties to keep them in a state of terror. Every day is Naqba Day for Palestinians as long as they are occupied by the Israeli army & besieged by Israeli settler goon squads; as long as they are being forcibly removed from their lands to make room for Zionist settlers from all over Kingdom Come; as long as Israel maintains an apartheid system & engages in ethnic cleansing of Palestinians. Those who oppose the misanthropic & dystopian Zionist vision of a Jewish-only state do so because it is based on colonialism & the ethnic cleansing of Palestinians–& because it is a rightwing nationalist & supremacist pipe dream that persecution of Jews can be ended by rejecting the broader struggles against racism & colonialism & instead joining with colonial forces. 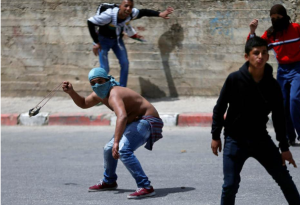 This photo from May 11th is Israeli occupying forces near the West Bank city of Ramallah & the Zionist settlement of Beit El aiming deadly weapons at Palestinians protesting in support of Palestinian political prisoners on hunger strike. This may not be the vision supremacist Zionist ideologues had in mind. This will remain the reality until Palestinian demands for self-determination are realized in a democratic, secular state where Palestinians & Jews can live as brothers & sisters. –demand no military or settlement aid to Israel. The Syrian revolution against Assad’s dictatorship began, like all the Arab uprisings against tyranny (now called the Arab Spring), in early 2011. Hundreds, if not thousands, of mobile phone videos poured on to social media recording the events in Syria day by day, almost moment by moment. There were protests against Assad in one city after another, day & night, numbering in the hundreds of thousands; there were young protesters scaling regime billboards with images of Assad to tear them down, so repugnant is hero worship to the democrat. Now to support their counter-revolutionary narrative, Assad supporters are on a campaign to deny the revolution ever took place just like they dismiss all the Arab uprisings & claim they were street dramas orchestrated by US & Israeli agents provocateurs. The denial is rooted in Islamophobic contempt for Arabs & Muslims & promoted by those with a vested interest in maintaining autocracy in Syria & the Middle East. 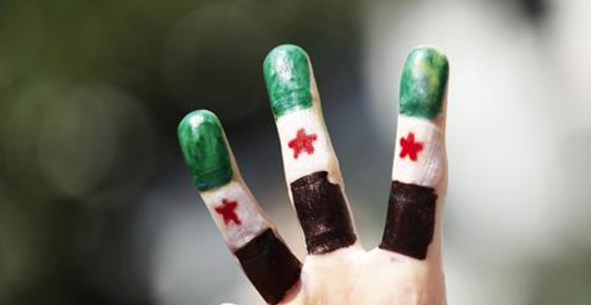 This brilliant article is by Yassin Al Haj Saleh, a longtime political activist who spent 16 years as a political prisoner in Syria, was part of the Syrian revolution, & is now in exile. Compare his analysis to the tripe now appearing in Russian media & being peddled by Assad supporters & propagandists. Assad apologetics are usually a compendium of outright lies, conspiracy & regime-change scenarios, abject hero worship, Islamophobia, & hatred for Jews masked behind anti-Zionism–the usual rubbish of Global Research, RT, & Sputnik News. There is a fourth impossibility that Yassin Al Haj Saleh’s article did not mention: that Stalinism would be resurrected from the grave & combine with the deranged libertarianism of David Icke to play a political role in opposing the revolution against Assad. 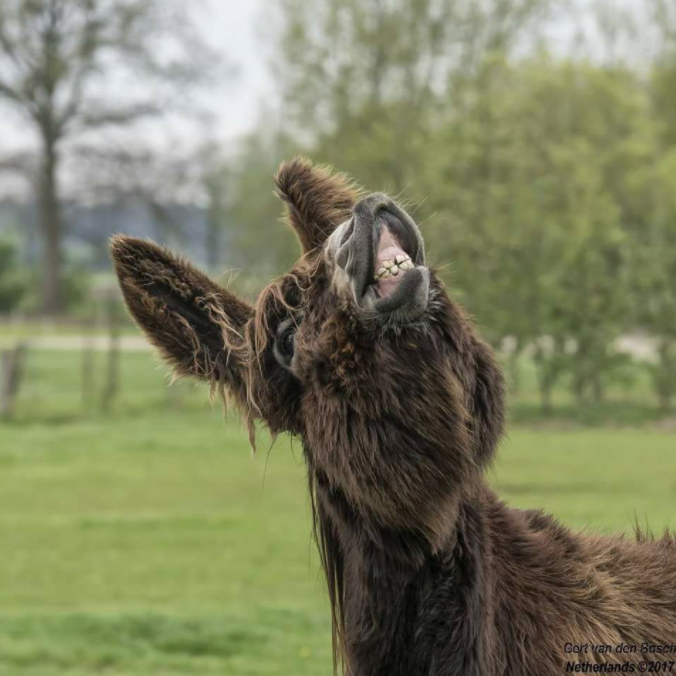 PS: With due apologies to the donkey. 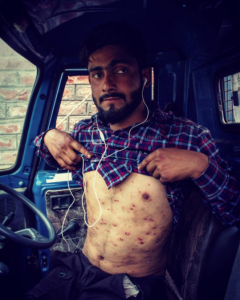 The photo & story of this young Kashmiri man speaks to the absolute criminality of the occupation & condemns the use of pellet guns that blind, disfigure, disable, cause permanent harm & pain to Kashmiris, including bystanders to protests, children, elderly, those sitting in their homes. Thank you to Chalukyan G.